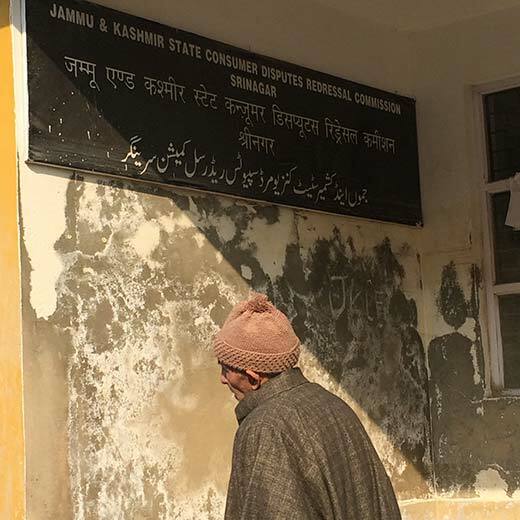 Rushing towards a stone building in old Secretariat, Manzoor Ahmad Ahangar was late by 30 minutes for the hearing of his case in Divisional Consumer Protection Forum (DCPF), Srinagar. Ahangar, in his late forties, a blacksmith by profession was doing his small scale business in Ganderbal, where he had eight people working for him. But, in the start of 2013, he thought of expanding his business and got a loan of Cash Credit (CC) for Rs 5 lakhs from J&K bank. Till December 2013, everything was going smoothly when Ahangar’s shop got robbed. Soon after, Ahangar took a job, which earned him Rs 5000 a month, to support his family. Initially he paid bank installments out of his savings, but as his savings started drying up, he went to a local court for help. Finally he filed a case against both insurance company and the bank in DCPF. Consumer Court is the special purpose court that deals with cases regarding consumer disputes and grievances. They are readily accessible forums to settle disputes speedily without entailing any cost that give consumers a safeguard against exploitation and unfair trade practices. Such courts are judiciary set ups by the government to protect the consumer rights, who can seek compensation, refund or replacement of defected products. The Jammu and Kashmir Consumer Protection Act, 1987, came into practice in 1989. Ahangar consulted a lawyer who advised him to file a complaint in Consumer’s Court. But three months and four hearings later, Ahangar’s case is yet to reach any conclusion. Other than that, most of the cases get delayed because, sometimes, customers are unable to produce any witness’. Consumer’s Court only gives a verdict in favour of consumers if they have proof of exploitation, i.e., bills or other documents. If a consumer does not have the proper documents required for filing a case, then it would be very difficult for the consumer to win or even file a case. And as per the law, an alleged wrongdoer trader is asked to come to the court within 30 days. Another 15 days are given if he/she does not show up, says Jeema, who heads the panel of three persons – one judge and two members – who form the jury. This court’s main function is to maintain fair practices by the sellers towards consumers. Only documents are presented by the both parties. Advocates are not needed and verbal discussion is only done in cases where there is a requirement of witnesses, says Jeema. As soon as the proceedings start for the day, Ahangar’s case was taken up and he was asked to wait for 30 more days, as the notice was served to insurance company but they had not turned up. Ahangar bows down his head in agreement and leaves with tears in his eyes. There is one Divisional Consumer Protection Forum (DCPF) in every district of Kashmir, Jammu and Ladakh divisions, with an authority to settle disputes up to Rs 10 lakh. And cases above Rs 10 lakh are settled at State Consumer Disputes Redressal Commission – which has offices in Srinagar and Jammu. At present, there are 12,000 cases registered in different district forums, which include cases related to recent flood, pending insurance claims, cases against telecom companies, against extra money charged by airlines, against banks and faulty warranty services of electronic goods etc. “About 80 cases are heard every day in DCPF Srinagar. And most of the cases are related to recent floods and insurance disputes,” says Jeema. A few miles away in Karan Nagar where State Consumer Disputes Redressal Commission (SCDRC) is located, complaints involving cases worth more than Rs 10 lakh are entertained. Kiramani says that one of the major achievements of SCDRC is settlement of infamous Hajj scandal involving a private travel company named Hajeej Group. “Hajeej had duped aspiring pilgrims worth Rs 4.50 crores. We have so far reimbursed around 67 per cent of the amount to the victims,” claims Kirmani. “The rest of the amount will soon be distributed among victims as we have already sold off Hajeej properties and assets for the purpose,” says Kirmani. In another case still pending with SCDRC, Maknoona Iqbal from Kupwara has filed a complaint against Srinagar based SK Diagnostic Center seeking compensation worth Rs 34 lakh. But as soon as Maknoona gave birth, he was diagnosed having the same problem, as was diagnosed before his birth. “We went to AIMS in Delhi for his treatment a number of times where he went through a surgery as well. But we are not getting any positive results. My child is suffering and I can’t leave him alone at home. I was working in a government organization, where I am on leave without salary. I don’t have any option left,” she says. Maknoona consulted a lawyer who advised her to file a formal case against the diagnostic centre at SCDRC. “I am seeking Rs 34 lakh as compensation from SK Diagnostic Centre – 24 lakh that I spent on my child in Delhi and 10 lakh for the period I stayed absent from my job without pay,” says Maknoona. But Maknoona case is listed for next month as the accused has not responded to the forums notices. Kiramai says that the forum successfully solved another complicated case involving a cancer-stricken retired teacher. The teacher was duped for Rs 16 lakh by his nephew who used his forged signatures to withdraw the said sum. “He (nephew) got Rs 16 lakh transferred to his account by means of cheques, demand-drafts etc using his uncle’s scanned signature,” says Kirmani. “It was a case of cyber crime and we had to make amendments in the existing laws so that the money is returned to this ailing teacher. It took us a year to solve the case and finally that verdict was approved by the High Court. It later became a law,” says Kirmani.